Discussion in 'Scheduled Matches' started by Lanzer, Feb 23, 2017. Medusa Station was covered in black, pestilent ooze, blistering with the so-called gifts of Nurgle. The presence of Slaneeshi musk made the air stale and thick. False Sorcery and corrupting promises of power lingered in the atmosphere. In the distance, the battle cries of the Khorne Berserkers twisted every marine's emotion, trying to lure them into violent battle. Without hesitation, the Captain ordered commands to his troops, then disembarked the Thunderhawk. It was not the first time his Chapter fought against the Arch-Traitors, and it surely would not be the last. This time felt different. The Captain was unable to figure out what it was, but his decades as a hardened experience told him that this battle would not be easy at all. "Onward, Brothers. Let us cleanse this place of Traitors for the Emperor. Let him, who resides on his immortal throne, guide our hand today. Show them the Imperium's Might!" Eternal Battles is hosting Match #1 on Saturday, February 25, 2017. Elector, Thurservorr and No_1 like this. 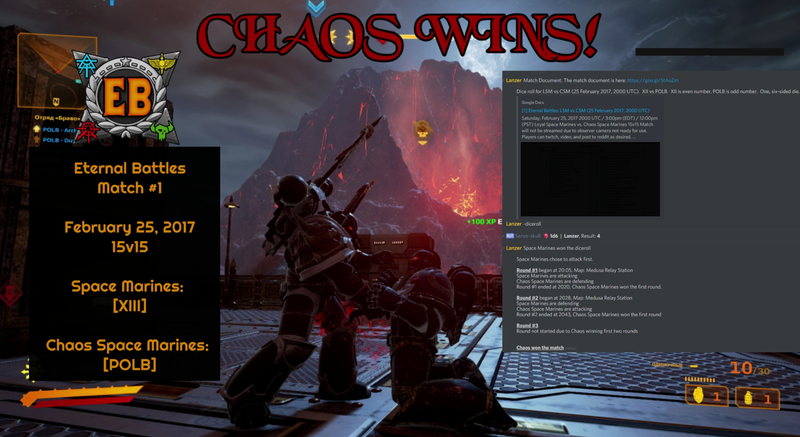 Competition is set up for Strike Force Ultra vs Bizarro Blops Squad, so invite Sons of Lorgar to the War Party to get them in. The wretched grin on the Chaos Lord knew no bounds when he saw the blood that had been spilled on the ground, walls, vehicles, and armor of his warriors. The Loyalists fought mightily, but were felled to the last. The Chaos Gods smiled upon him this day. He picked up the helmet of a fallen Ultramarine, chuckling at the decapitated head as he let it fall back down into the mud. He ordered the Chaos Marines to finish the effigies to their lords and embark their rhinos. "What a wonderful day. The Dark Gods are with us. Those Ultramarines didn't even stand a chance. Now make haste, my warriors! There are more skulls to split, spines to break, and chests to chop. Chaos...will..prevail!" Thurservorr, Monsix and Elector like this. Thanks, the correction was made. Screenshot updated. Oi! I missed the match, how did it go? It went well, LSM and CSM fought hard. CSM was able to come out on top though. Good ta hear! I likes dem spikey boyz, dey give a good fight!